Nami the Kishu Ken at 2.5 years old—"Nami, shown here as a 2 and a half year old, is a Kishu Ken from Kishu Yoshitaka Sou in Osaka, Japan. 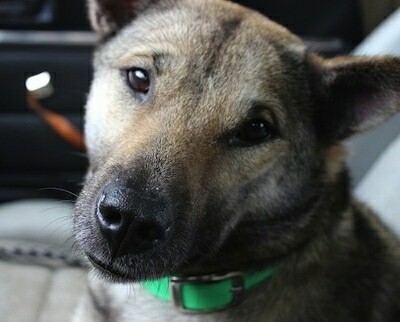 She was imported as a pup with the help of Japan Dog Export and a couple of awesome friends. 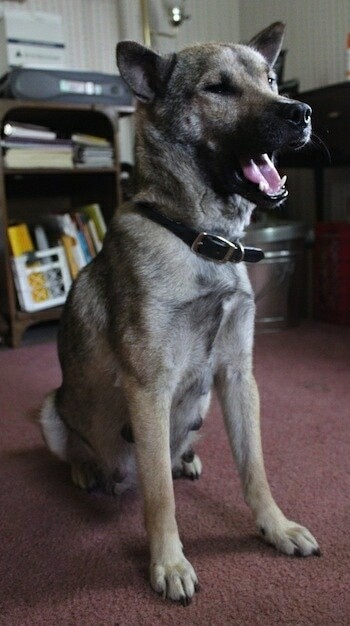 She is currently NIPPO registered with the capability of multi-registration in the JKC, AKC and/or UKC. I hope to have her registered with the AKC by later this year to compete in agility. Nami is bold, curious, and enthusiastic about most things. She is extremely intelligent, clever, and can be easy to motivate, but she is a hunter through-and-through. Once she is set upon something, she can be difficult to redirect. She is the first "yushoku" (colored) Kishu in the USA, but the second in North America. Her specific color is called "goma" (sesame). She had a sesame dam and a white sire, so carries the capability of producing white puppies. 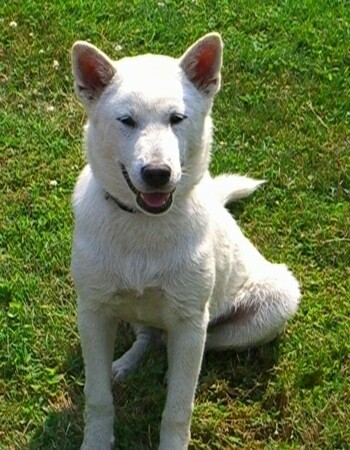 Bred to a white dog, she has the potential to produce yushoku or white puppies. She recently had a litter when bred to another NIPPO registered male. 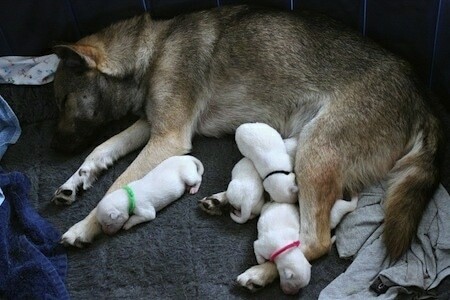 She had five healthy white puppies. 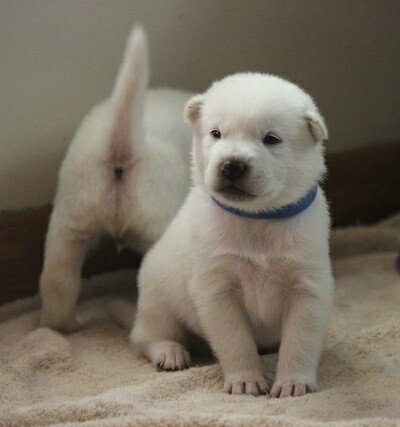 All puppies are registered with NIPPO - the leading Kishu Ken registry in their country of origin - with the capability of multi-registration as well. 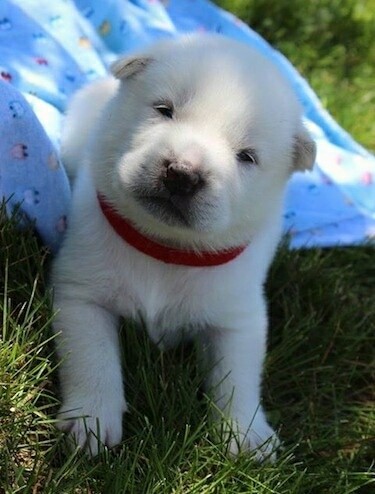 Kishu Ken can sometimes be difficult to obtain because of the relatively few non-Japanese breeders, but there are people and groups happy and willing to get pups overseas. I am grateful for all the people who helped Nami get to me!" 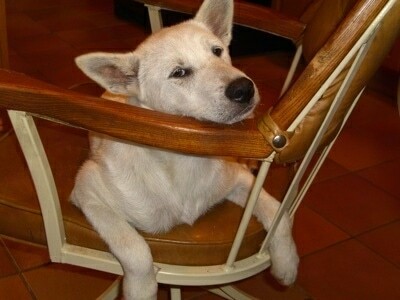 The Kishu Ken is a medium-sized sturdy dog. The coarse double coat is short and straight with a thick, soft undercoat. Coat color mostly comes in white, but occasionally brindle, sesame or red do occur. The nose is usually black, but can be brownish or pink. Has a scissor or level bite. Has a broad head with prick ears inclined forward that are on the smaller side. Tail curls over the back. There is fringing on the tail and cheeks. 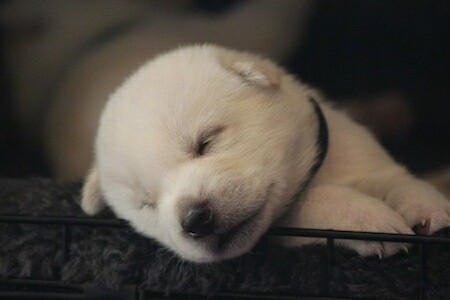 It has a close resemblance to the Shiba Inu, Akita Inu and Ainu Dog. The Kishu Ken is loyal and loving with its family. It is a friendly, quiet and calm, but tough and agile breed. Intelligent, clean and easily housebroken. Can be aloof with strangers; socialize well. Not a barker. Does well with other dogs. 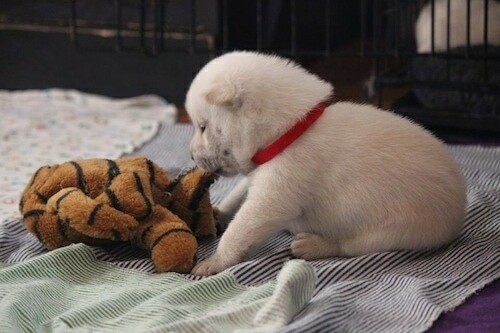 An excellent pack hunter, the Kishu stalks prey rather than barks. It has a high prey drive and should be socialized with cats at a young age and should not be trusted with other small non-canine pets such as hamsters and guinea pigs. The Kishu has been known to climb trees to catch prey. This breed needs an owner who is calm, but firm, confident and consistent, displaying a natural authority over the dog. If the Kishu senses the humans around it are weaker minded than itself, it will become headstrong and willful as it will assume the position of the leader. Proper human to canine communication is essential. A Kishu Ken that is well socialized and that sees itself as below humans in the pack order will be good with children. Children should be taught not to tease the dog. Does not do well in a kennel environment, they need to be part of the family. Should have a fenced-in yard. The Kishu Ken has a somewhat high energy level. It will do best with some type of job to do. Your dog needs to be taken on a daily, long walk or jog. While out on the walk the dog must be made to heel beside or behind the person holding the lead, as in a dog's mind the leader leads the way, and that leader needs to be the human. Brush weekly with a firm bristle brush, and bathe only when necessary. Trim nails and check ears regularly for dirt, wax buildup or infection. The Kishu is also called a Kishu Ken or Kishu Inu; both ”ken” and ”inu” are Japanese words for “dog.” The Kishu is very rare outside of Japan. It has been a "Protected Species" in Japan since 1934, which is a major reason why it is so rare. 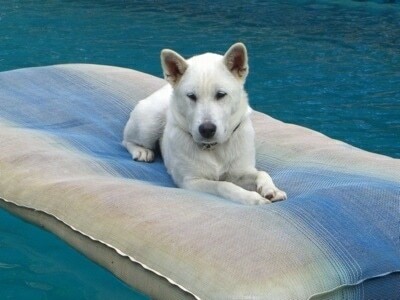 The Kishu is a very ancient breed; some sources say it has been bred for 3000 years or more. It originated in the mountainous region of the island of Kyushu, the southernmost island of Japan. Prior to the western influence of breed purity, the Japanese breeds were all considered one breed separated by size and location. 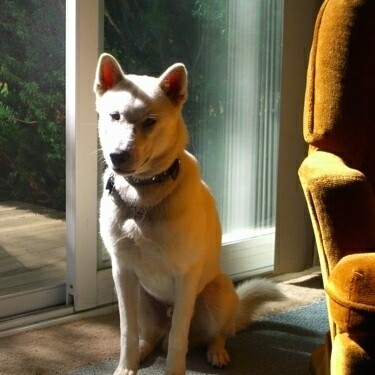 Shikoku Ken and Kishu Ken were frequently crossed and considered purebred. All of the breeds are closely related, sans the Hokkaido Ken (Ainu Dog), which was traditionally isolated. The breed was originally used to hunt deer, wild boar and sometimes bear. There is a Japanese expression to describe his hunting prowess, "one dog, one shot." This means that the Kishu would hunt and keep the prey at bay until the hunter could catch up and approach close enough to kill the prey with one shot. Nowadays the Kishu is still used in Japan to hunt boar but generally it is kept as a pet. "Tarot, short for Kishu Ken-nels Zigmund Stardust de Tarot the Kishu Ken—Tarot is a very handsome, energetic guy who needs a big yard. He is extremely intelligent and by the 2nd day I had him, was walking on a leash better than my last dog ever did (truth). He is generally very quiet, but he loves to play, especially outside. He is very fast and agile and takes great joy in being trained. Tarot has now completed his AKC title in Advanced Rally, gotten his 1st leg in AKC Novice Obedience and six 1st place wins with the American Rare Breed Association. He needs 3 more 1st place wins to become a Champion, which should be completed by this fall." 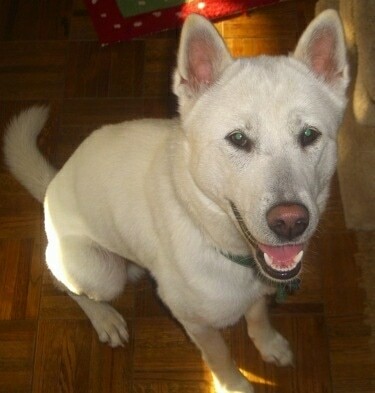 "Tarot the Kishu Ken is a sweet, good-natured dog that I've never seen snap at anyone. He loves to give a lick and when he opens his mouth it forms a natural smile. He has slanted triangular eyes. 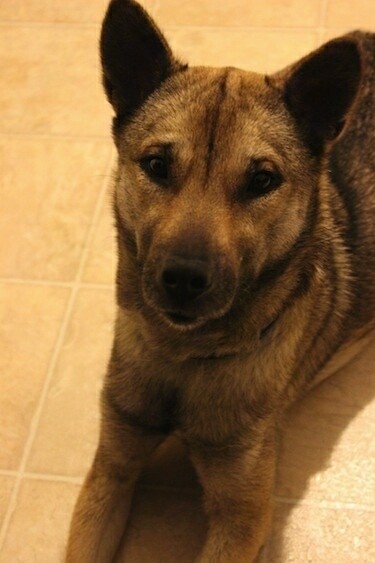 I have read that the Kishu breed was a Japanese attempt to create the perfect dog. I won't say that Tarot is perfect, but he is the kind of dog that people instantly fall for. I attribute this to his good looks and good nature. My youngest daughter says she smiles every time she thinks of him."